The labyrinth was designed,laid out and financed by Marianne Fulfaro as a dedication to her parents, Carlo and Carmela Annunziato. It is designed after a seven circuit Middle Ages Mini-Chartres design and it constructed of paving stones with red gravel as the pathways leading to the center. Along the garden pathways are etched memorial paver stones, benches and mosaics. 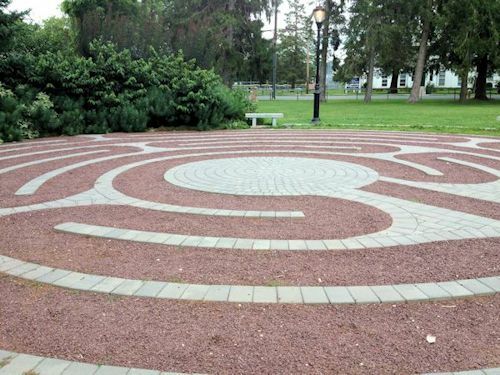 Visitors can walk the labyrinth, meditate, pray or just enjoy the peaceful gardens. 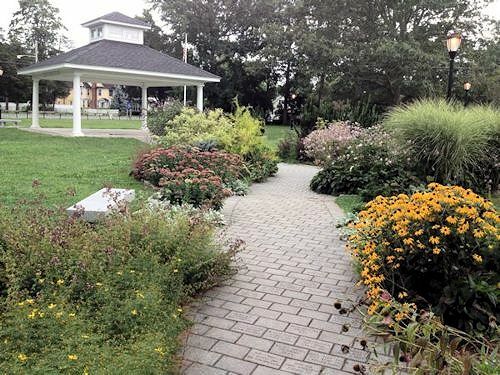 The gardens leading to the labyrinth were created through voluntary efforts, donations from community members, grants and support from the Town of Islip. 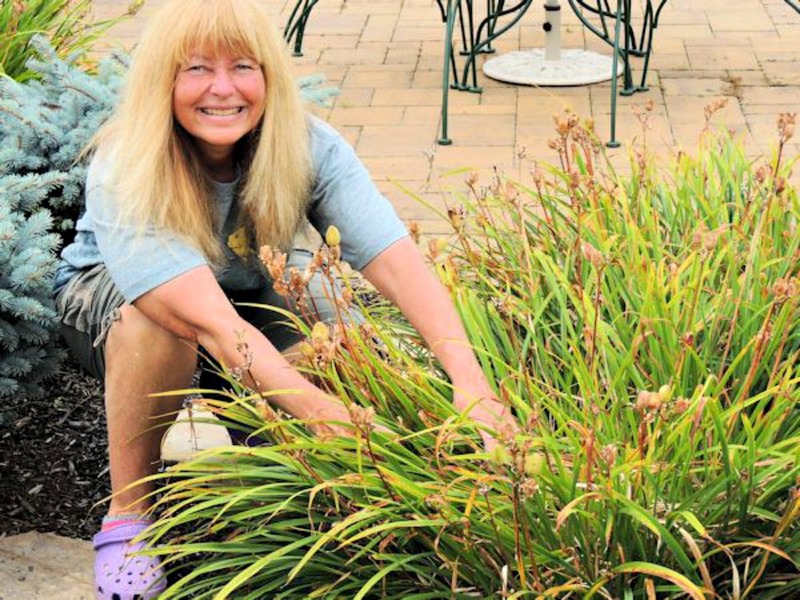 They are maintained through the loving hands of Master Gardener Nancy Angermaier and community volunteers. 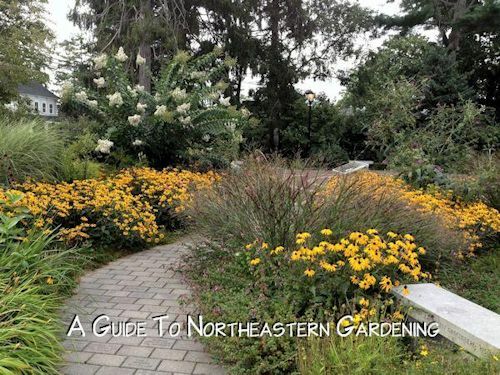 The grounds of the Common Ground are especially lovely near the end of the summer when sprays of Rudbeckia (Black Eyed Susan), Echinacea (Coneflower), Sedum, Crape Myrtle, Butterfly Bush and Fountain Grasses grace the landscape. 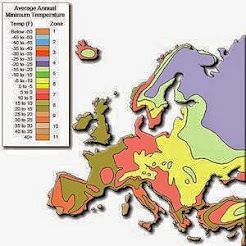 For additional interest a number of colorful evergreen and deciduous shrubs such as Montgomery Globe Spruce and Barberry also grace these gardens. Along the benches one can also admire Stachys (Lamb's Ear) and Coreopsis. A Butterfly Bush (seen in the backdrop) draws Monarchs and Swallowtails to the garden. This pavilion was designed and constructed as a common ground for community members to gather and appreciate the arts. Residents of all ages gather here and enjoy the feeling of community and unity. I cannot seem to get enough of this lovely tribute. 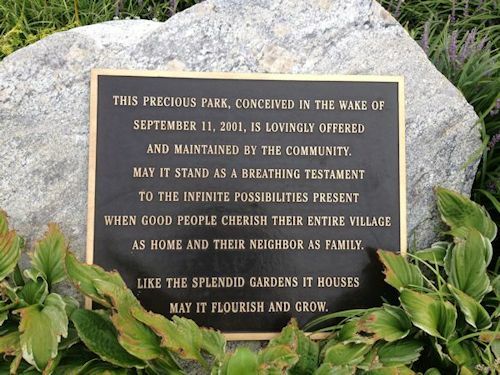 It is a place I visit often and return to over and over again with loved ones to experience the warm and comforting feeling of a community that is truly joined by a garden. 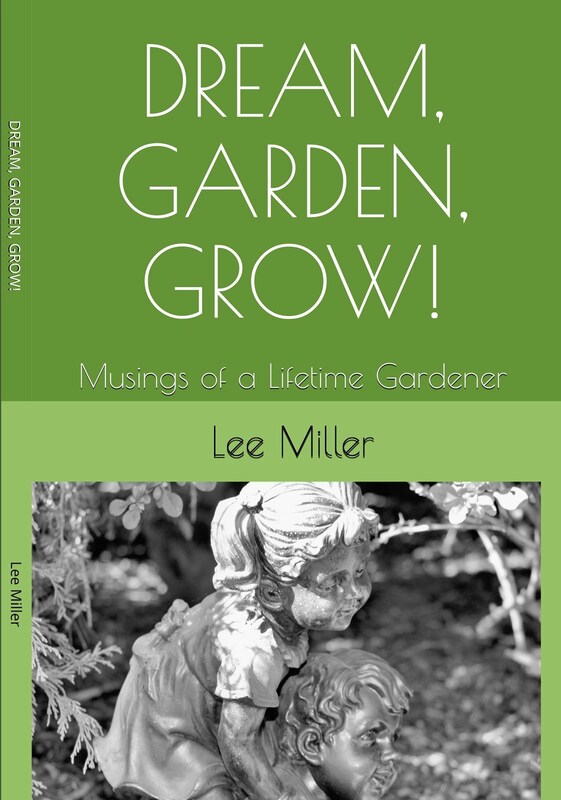 I am pleased that am able to share this lovely place with my readers for its true beauty is not only in the gardens but in the hands that were used to create it. The plaque below says it all. 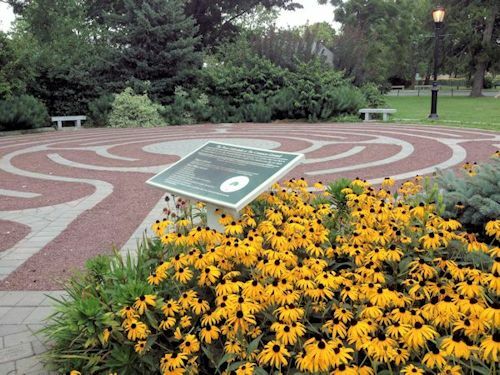 If you are ever in the Sayville area be sure to stop by to experience the Peace Labyrinth. The Labyrinth and gardens are open to the public and there are full moon walks available throughout May to October. Special memorial services are held on September 11th -weather permitting. 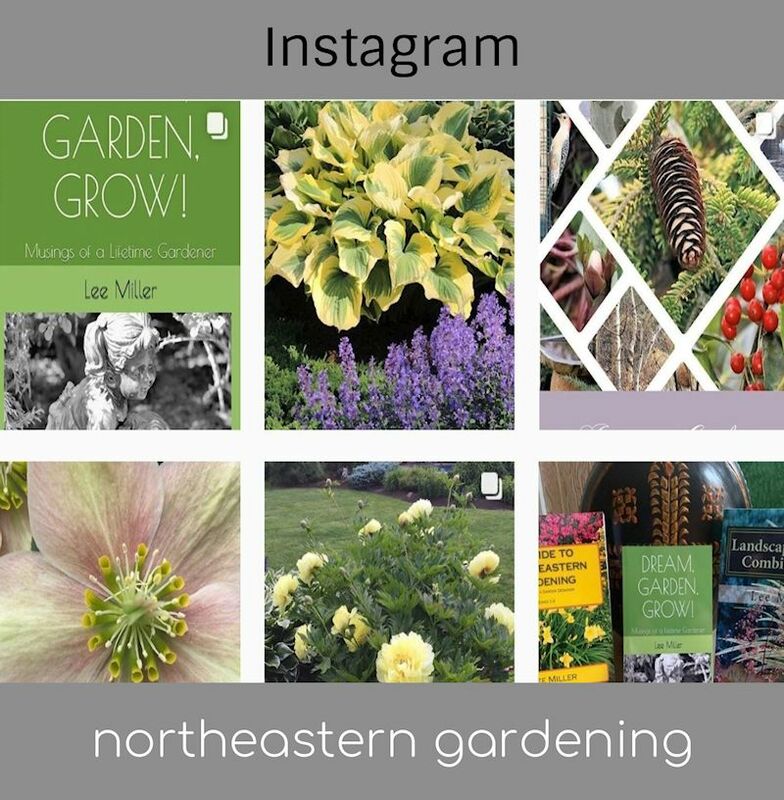 Hope you enjoyed the visit and As Always...Happy Gardening! It is 84 degrees with a steady breeze coming off the ocean and there is a feel of autumn in the air despite the warm temperatures. I sit enjoying an afternoon tea and gaze into the garden as the month of August and summer swiftly breeze by. 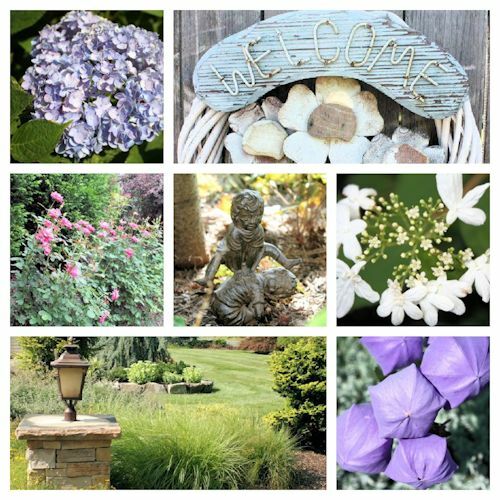 Thanks to Carol at May Dreams Gardens another Garden Blogger's Day has arrived and it is time to take a walk in my zone 7 Long Island garden to see what is blooming. 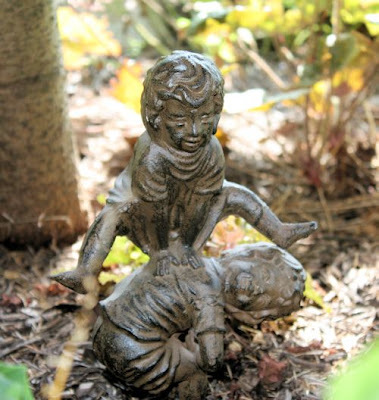 At this time of year it also a nice time to focus on structure in the garden so you will also be experiencing some whimsical moments! Come long...let's take a look! First stop is the Crape Myrtle that is in full bloom on this lovely day in August. Just as many of the other blooms start to fade I wait in anticipation every August as the vibrant pink blooms of this tree start to spike and burst into magnificent flowers that last well into Fall. As we walk around the bend there is a little bit of whimsy...a playful statue of children playing leap frog recently given to me by dear friends as a new addition to the garden. 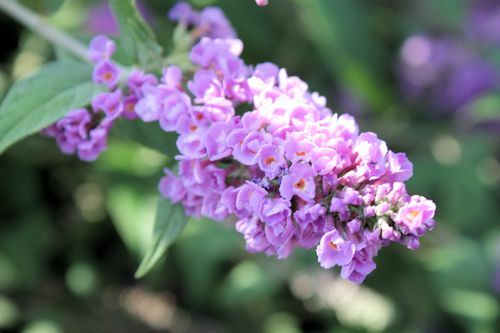 The dwarf butterfly bush that I planted last spring is supplying me with a second season of wonderful purple blooms that attract may varieties of butterflies to the garden. 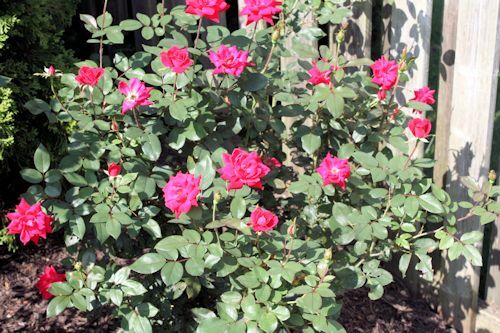 It blooms for several months from July into the Fall and brings so much enjoyment. 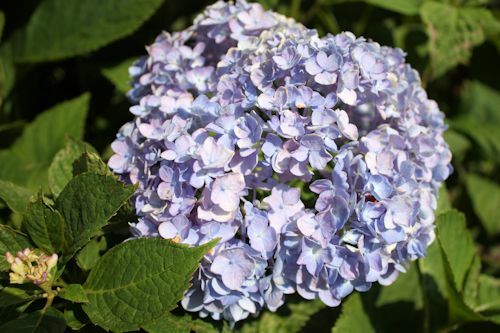 The hydrangea are all in bloom as well at this time of year. 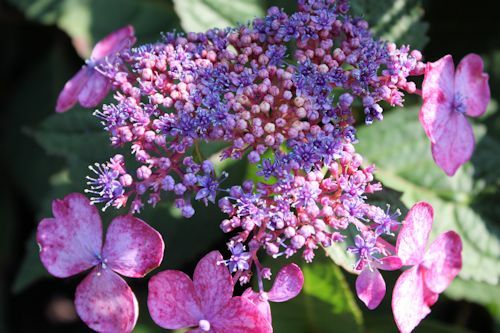 Here are two of the many varieties, 'Nikko Blue' and from the Endless Summer Collection Hydrangea 'Twist & Shout', a lace cap variety. 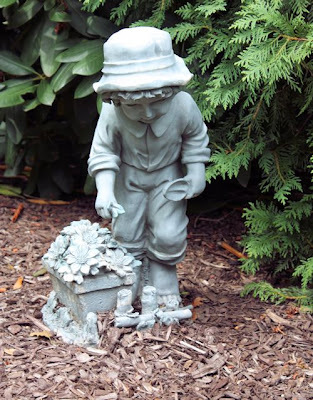 Beyond the Hydrangea and around the next bend is Garden Boy watching over the shadier part of the yard. There is nothing like roses in the garden. 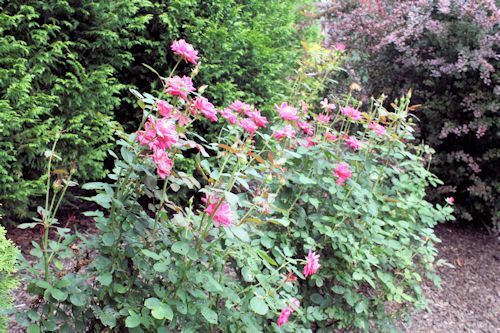 These Double Knock Out Roses bloom all summer long and bring continuous color to the garden even in August. They have been such a joy since I planted them a couple of years back and they put a smile on my face every time I look at them. And around the next corner...a place to stop and sit. 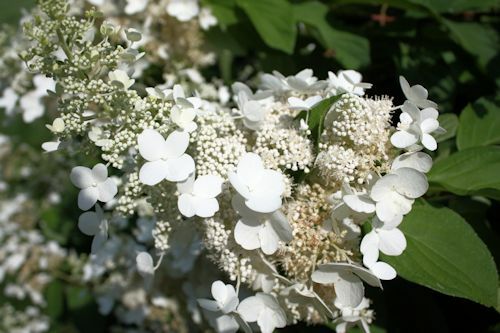 This Hydrangea 'Tardivia' started off as a medium sized shrub and has become a magnificent tree. 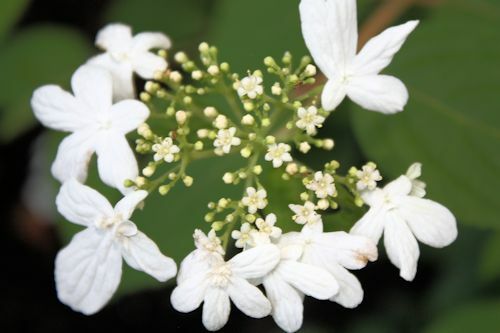 Large fragrant panicle blooms cover it completely throughout August and September. Above the grasses are going into Fall mode producing their feathery plumes. 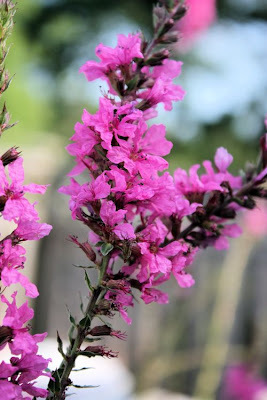 Below is the one and only Lythrum plant in the garden and it blooms beautiful fuchsia spikes at the end of the summer when many of the other plants are fading out. 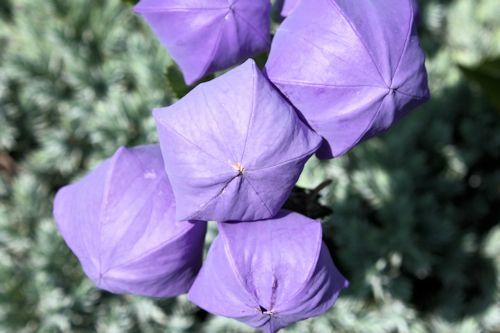 Platycodon (Balloon Flower) is so much fun in the August garden and a bit whimsical with its blue balloon-like flowers. Once they dry out they are also fun to pop like the plastic wrap you loved to pop when you were a youngster...or adult! Different textures in the shade garden. 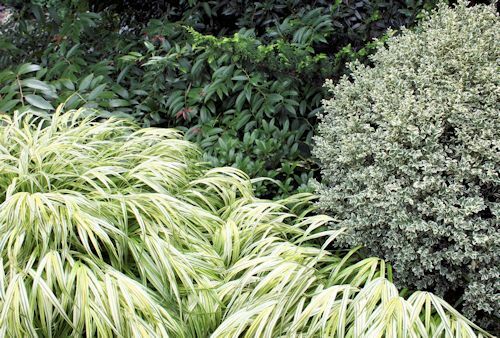 Here is a mix of Hakonechloa (Japanese Forest Grass), Variegated Boxwood, Leucothoe and Nellie Stevens Holly. 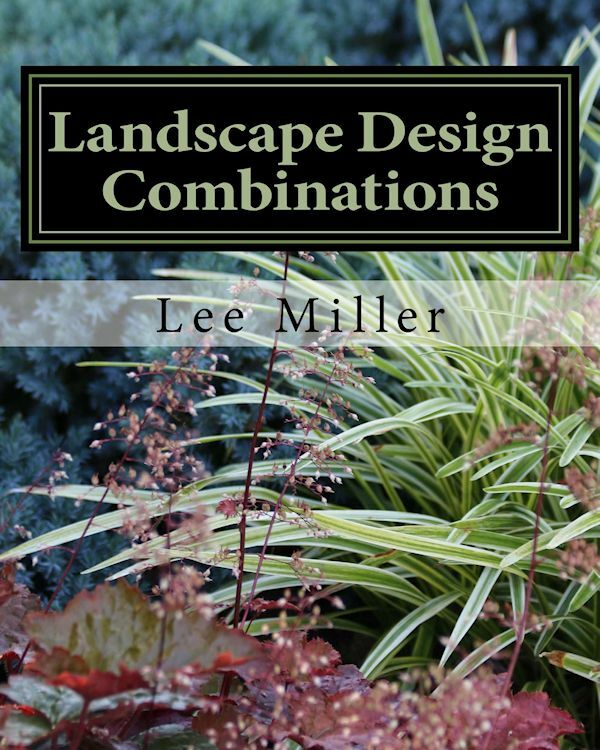 I enjoy using different textures of foliage to add interest to the garden. 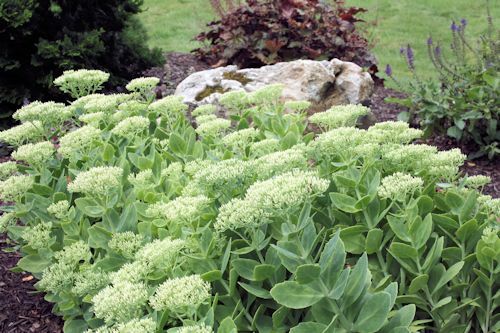 The Sedum 'Brilliant' is almost ready to bloom! 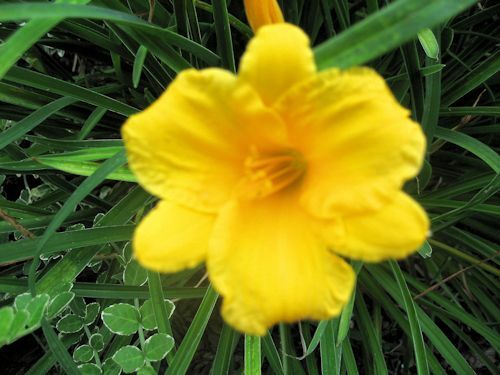 The 'Stella D Oro' Daylily are still blooming! The Viburnum is in all its glory. 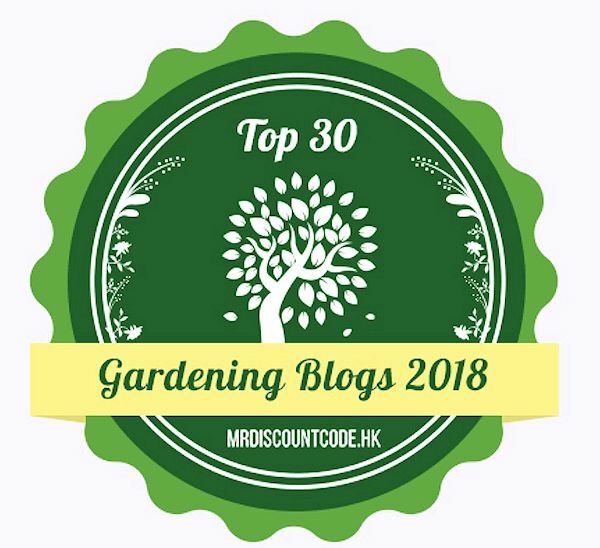 Thank you for visiting and be sure to visit Carol at May Dreams Gardens for more gardens around the world in the month of August. Happy Garden Blogger's Bloom Day and As Always....Happy Gardening! 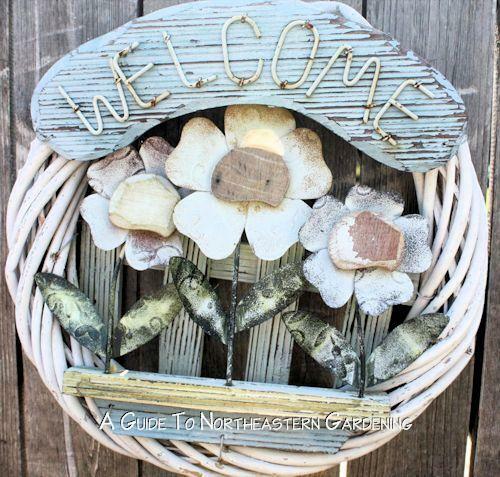 August is the perfect time to revitalize your summer garden. 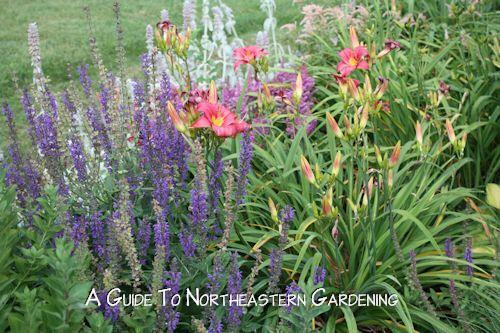 Perennials such as daylily, nepeta, astilbe and salvia can be cut back to revitalize and extend their bloom season. 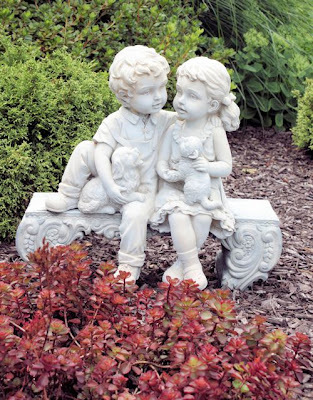 Here are some easy tips to give your garden a face lift. When your salvia and nepeta start looking less than desirable, deadhead by pinching back any spent blooms so that the next set of blooms can gain strength and form. 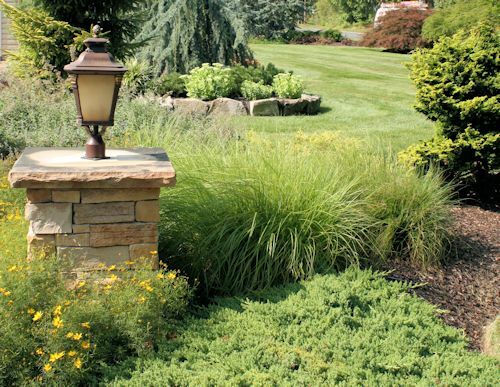 In late summer (end of July/Early August) cut back "worn out" perennials several inches, removing all the dead stalks and spent growth, making the appearance of the plant resemble the first growth of spring. 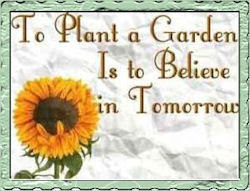 The plant will be fooled into sprouting new growth and new blooms will form that last well into Fall. 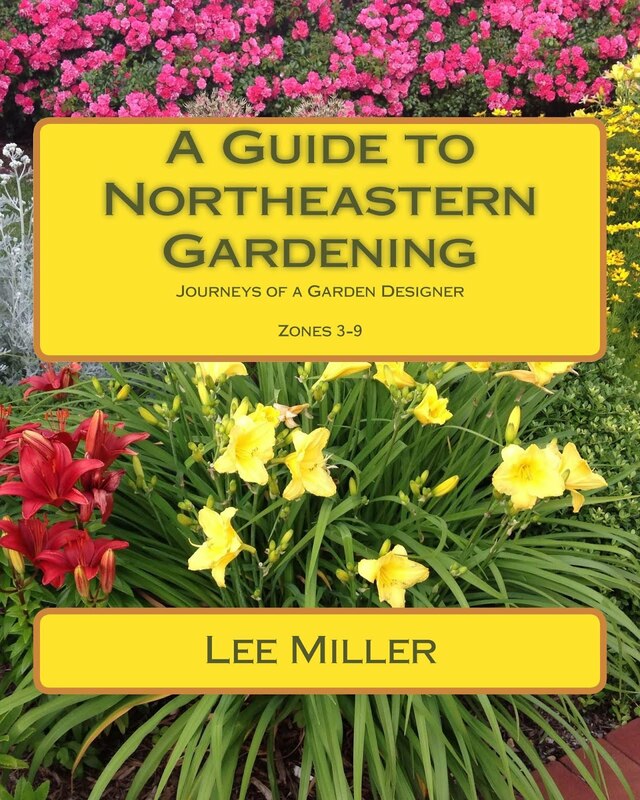 When my daylilies are done blooming and foliage starts to yellow and brown, I completely revitalize them by tearing out all the old foliage and spent stalks to approximately 4-6 inches above the ground. 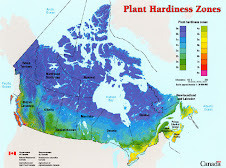 Within days new growth will quickly emerge forming a revitalized plant thus extending the bloom season. 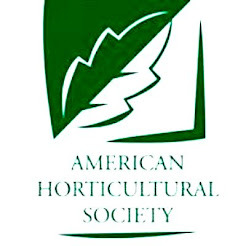 For astilbe keep the spent flowers for they supply welcomed Fall interest but remove any browned foliage to give the plant a neater appearance. 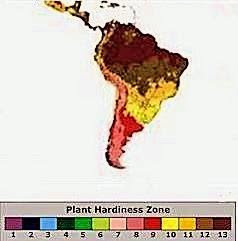 Cleaning up the plant may even spark some new flowers to form. Now it is also time to remove the seed pods and browned stalks from iris and spent flower stalks from hosta and heuchera (coral bells) to redirect the energy back into the roots and foliage. 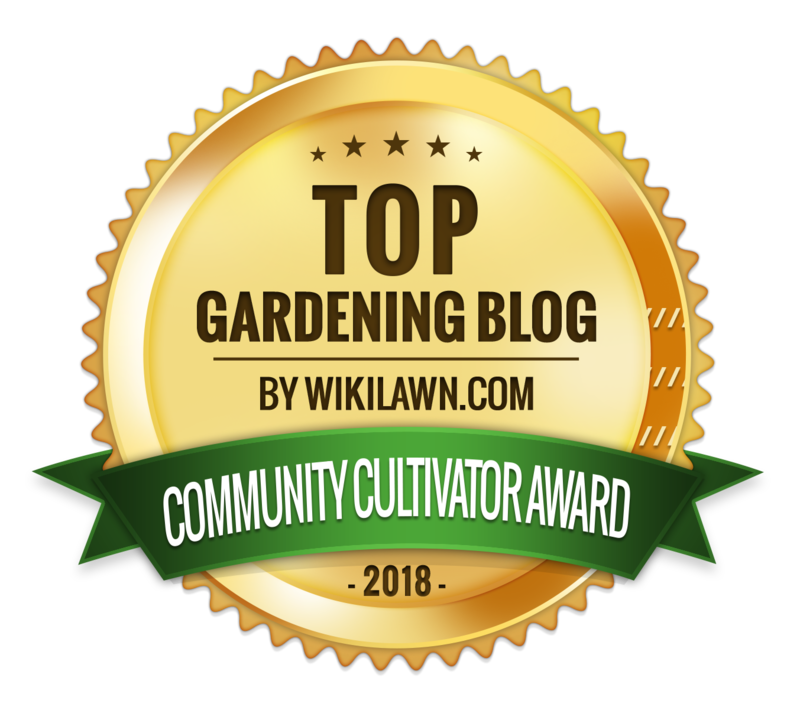 At this time I also clean up any hidden weeds and make sure that there is a good layer of mulch (about 2-4 inches) in the garden to keep the roots cool, ensure moisture retention, add organic matter and of course form a weed barrier during the remaining hot days of summer. 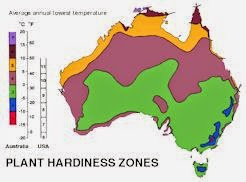 Also plants need approximately one inch of water per week to their roots in order to survive the drought of summer. 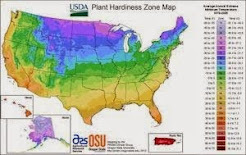 It is healthier for the plants to water deep and less often rather than every day at short intervals. 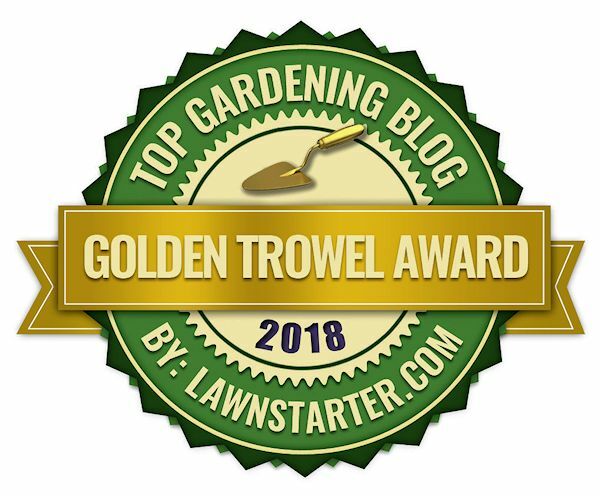 Performing these few simple tasks will revitalize your garden, extend its lifetime and give you several more months of enjoyment out of your landscape!